FORT ELLIS, N.S. -- Three women described as "grassroots grandmothers" were arrested Wednesday at a rural construction site north of Halifax, where an Indigenous protest camp has long held up a company's contentious plan to build a natural gas storage facility. The blockade was started more than two years ago to stop Alton Gas from using water from the nearby Shubenacadie River to create large, underground storage caverns. Protesters fear the 73-kilometre tidal river, which cuts through the middle of Nova Scotia, may be polluted. It was unclear what happened when RCMP moved in Wednesday to enforce a court-ordered injunction, however police said the arrested women were later released. 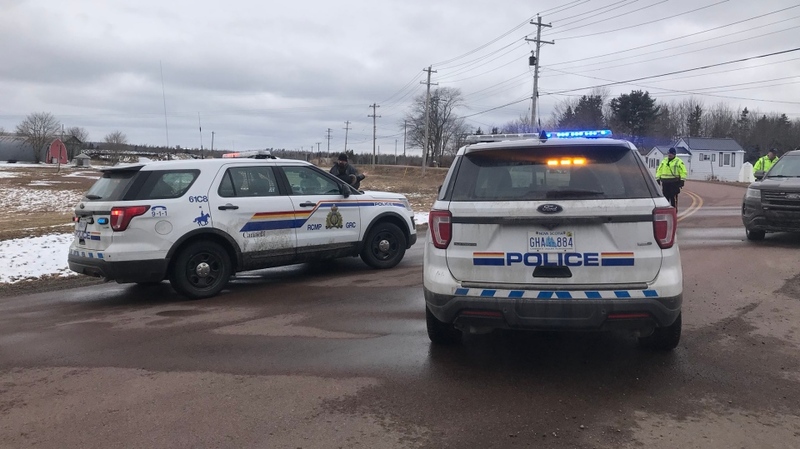 The RCMP had earlier set up roadblocks, preventing journalists and other protesters from reaching the site at Fort Ellis, N.S. "The RCMP is absolutely impartial in this," Cpl. Jennifer Clarke told reporters and a handful of protesters at a roadblock about three kilometres from the work site. "We respect Indigenous culture and we also respect the company's right to conduct their business." The Mounties later issued a statement saying a police negotiating team was sent in to talk to the protesters at 9 a.m., but they said those talks led nowhere after three hours. "When it was determined that the terms of the injunction were not going to be met voluntarily, discussions continued and (RCMP) members took three women into custody without incident for civil contempt of an injunction order," the statement said. "We will maintain an increased presence in the area to monitor the situation." 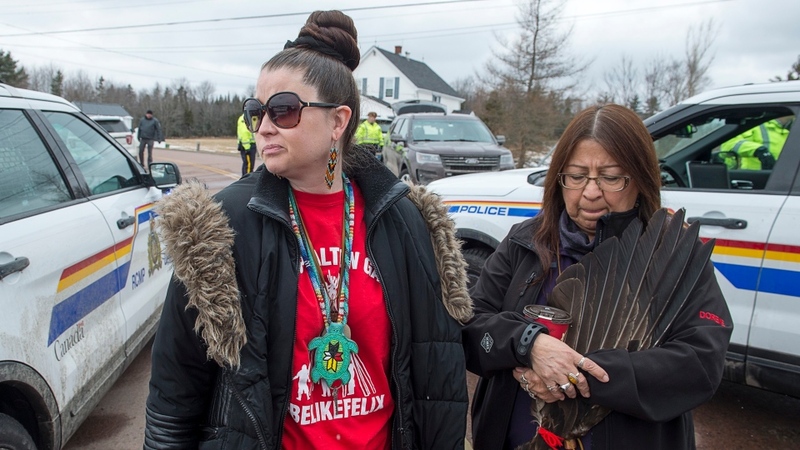 Protest leader Dorene Bernard, an academic and member of the Sipekne'katik First Nation in nearby Indian Brook, N.S., referred to those arrested as "grassroots grandmothers." "We have a long fight ahead of us," she told reporters at the roadblock. "This is our treaty right. It should be our and other Nova Scotians' right to stand up to protect their water." Bernard expressed frustration with the roadblock and the fact people couldn't see what was happening at the protest site. "We support our sisters and we support the water protectors," she said. "We are going to continue to resist Alton Gas and we are going to stop them." When the roadblocks were removed a few hours later, the protest camp was empty. However, a tent and a two-storey hut made from straw bales remained standing behind the main gate. The company has said it plans to bring in heavy equipment to repair a pumping station near the river, which means the protest camp will likely be bulldozed. Down the road, where the company had set up a fenced-in area for protesters to make their views known, there were no demonstrators to be seen. However, about 10 red dresses were left hanging on the fence -- symbols meant to draw attention to the plight of missing and murdered Indigenous women. Critics of the Alton Gas project say it poses dangers to traditional Mi'kmaq fishing grounds, which have been used for more than 13,000 years. Last month, the Supreme Court of Nova Scotia issued a temporary injunction against the demonstrators, saying they had to move to the fenced-in area along Riverside Road. Protester Paul Jenkinson, a resident of Tatamagouche, N.S., and a member of group called Sustainable Northern Nova Scotia, said the police raid marked a sad day for Indigenous relations. "The grandmothers have simply been acting on their right to protect the water," said Jenkinson, who was carrying a colourful placard that said "Stop Alton Gas." "I think most people appreciate what they are doing. The corporate agenda is winning out and the police are acting on behalf of Alton Gas." The $130-million project has been largely on hold since 2014 when Mi'kmaq activists started a series of protests that culminated two years later in the creation of the camp. Meanwhile, drilling for the first two caverns has been completed. The company, a subsidiary of Calgary-based AltaGas, has plans to flush out as many as 15 caverns near Alton, N.S., about 12 kilometres from the river. In a statement Wednesday the company said it needs "safe and unobstructed access" to its work site in order to repair equipment damaged from flooding. "At Alton, we respect the right to peaceful protest, but for safety reasons, the work site itself is open to Alton employees and approved contractors only," the company said. "We are committed to working with government, the Mi'kmaq of Nova Scotia and local communities on the next steps regarding development of the Alton Natural Gas Storage Project." Earlier this week, provincial Environment Minister Margaret Miller said the government had conducted sufficient consultations with the Sipekne'katik First Nation, saying "extended efforts" were taken to explain and mitigate the potential impact on fish, fish habitat and Aboriginal rights. Miller said she also determined the province's conditions for the project were sufficient to protect the environment, saying there are safeguards in place to prevent excessive salinity in the river. The First Nation had filed an appeal of the province's industrial approval for the project. Alton has already received the environmental and industrial approvals it needs to proceed, including two environmental assessments and an independent third-party science review. The company says the leftover brine solution will be pumped into the river, twice a day at high tide, over a two- to three-year period. The peak release on each tidal cycle will be approximately 5,000 cubic metres, which will be mixed in with four million cubic metres of brackish tidal flow from the Bay of Fundy, Alton says. The company says the brine flowing into the Minas Basin "would not be detectable and would be insignificant in terms of the natural fluctuation of salinity the ecosystem is subject to during each tidal cycle." 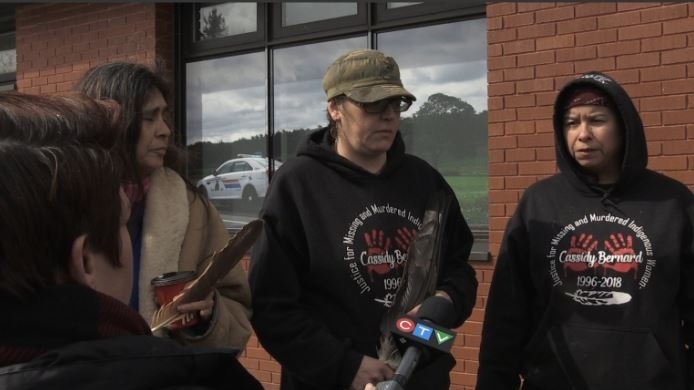 The three women who were arrested on April 10, 2019, speak outside the RCMP detachment in Enfield after they were released. From left, Darlene Gilbert, Kukuwis Wowkis, and Kiju Muin. 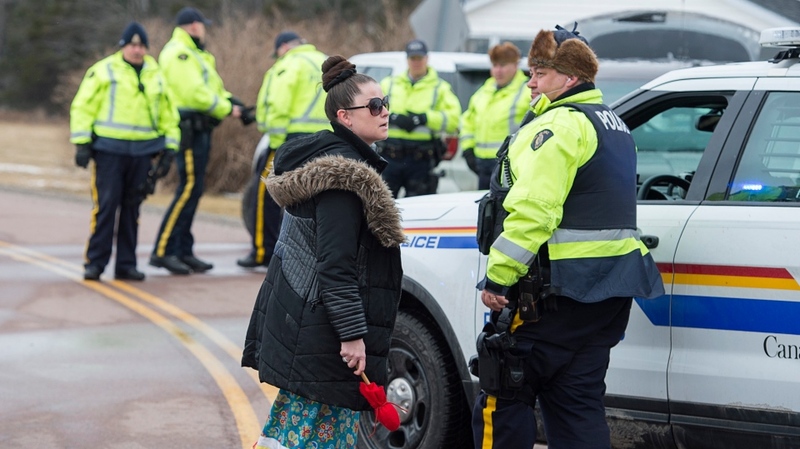 The RCMP block the entrance to Riverside Road, where protesters appeared to be blocking a construction site, on April 10, 2019.